"You have no idea how I suffered," she says of her life before her daughter. "The pain I lived with. I used to work all day, but my nights were spent in tears." Kaur married her husband, Gurdev Singh, when she was 18 and he was just a little older than 20. She simply assumed that children would follow marriage, and there was no question of waiting. 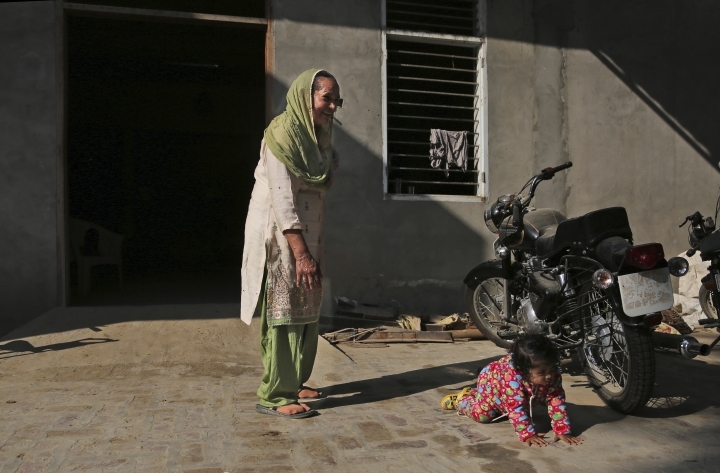 Her new relatives were relatively wealthy Sikh landowners in this corner of Haryana, and they had the means to raise a family and property to leave to their offspring. But no children came. She felt worthless. "I asked God why he had abandoned me. I had been a good Sikh, a good person. Then why?" she asks, as she nervously fidgets with the green scarf she uses to cover her almost entirely grey hair. With each decade she felt the dream slip further away. 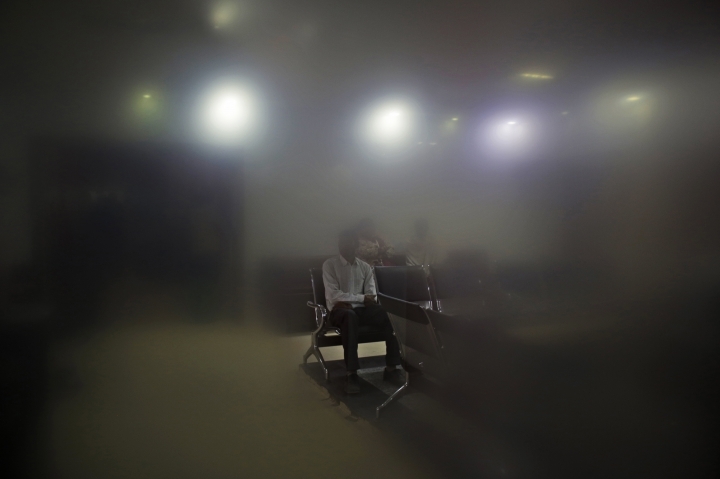 The couple tried IVF twice in their 40s at two separate clinics in north India. It didn't work. A woman in Kaur's setting, without a child, is an inauspicious creature. Her very presence is often shunned at social gatherings, especially at weddings and birth ceremonies which celebrate fecundity. "What I suffered you will not understand. People would turn their faces away from us," she says, wiping away the tears that run down her cheeks, lined by age and years of working in the sun. For the vast majority of married Indian women, the inability to produce a child, preferably a son, can result in the taboo of divorce or abandonment by their husbands. For years Kaur begged her husband to take another wife. "I wanted to marry him off myself. I was willing to do anything for this family. I said to him, this property, this house needs an heir. I haven't been able to give you a child," she says, as she walks through the guava trees outside her house, plucking fresh fruit for her visitors. "I said I won't do it," says Singh, a short man with a smile constantly hidden behind his flowing white beard. "If it's meant to be, God will give me a child with you. If I marry again, what will happen to you?" They lived, like most rural Indians, with extended family, and Kaur showered all her love on the nephew and niece she helped raise. She says it is perhaps her unconditional love that made God and the Sikh gurus turn her fate around. 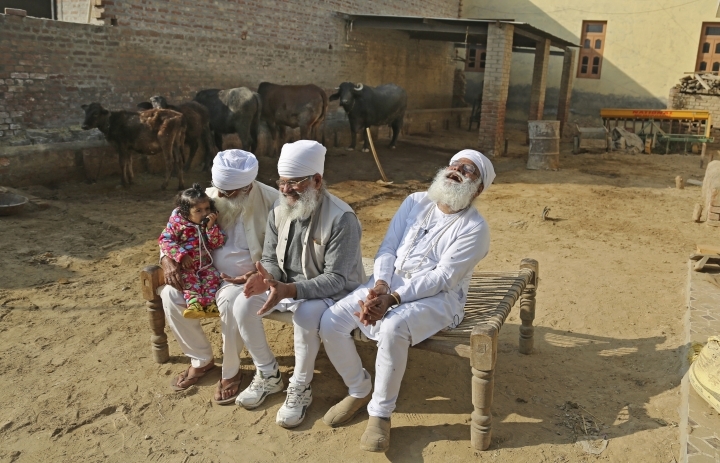 It was Kaur's nephew who first heard of Bishnoi, the doctor in the nearby town of Hisar, who had built a prosperous medical practice and tidy little business empire by helping aging women across north India have children through in-vitro fertilization. The couple was at first hesitant, thinking about all the problems of such a late pregnancy. But meeting the doctor changed all that. "He treated us with so much respect and love," Singh says. "Doctor sahib was like a god to us." His harshest critics in the medical community accuse the embryologist of making money off the dreams of the desperate, and of taking wildly unnecessary risks with older women. When Bishnoi helped a 70-year-old woman give birth last April, Dr. Hrishikesh Pai, who heads a federation of Indian gynecologists and obstetricians, called him a "rogue doctor" and "repeat offender" who ignores the self-imposed guidelines that most other fertility specialists follow. 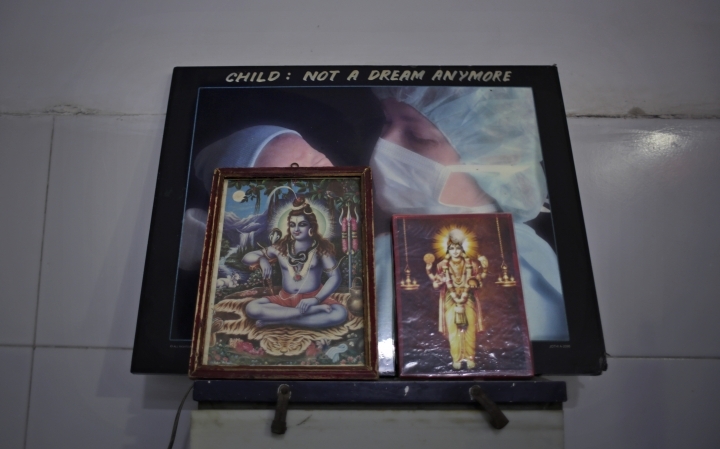 Dr. Narendra Malhotra, who heads the Indian Society For Assisted Reproduction, says Bishnoi is driven by a quest for records and has been attempting to "play God." Malhotra notes that if a woman gets pregnant at age 70, her child may be an orphan before the age of 10. He says his association has requested that Bishnoi stop his extreme practice of working with significantly older women, with no success. "He's not breaking any law because there is no law," Malhotra says. "But there are ethical and moral guidelines." 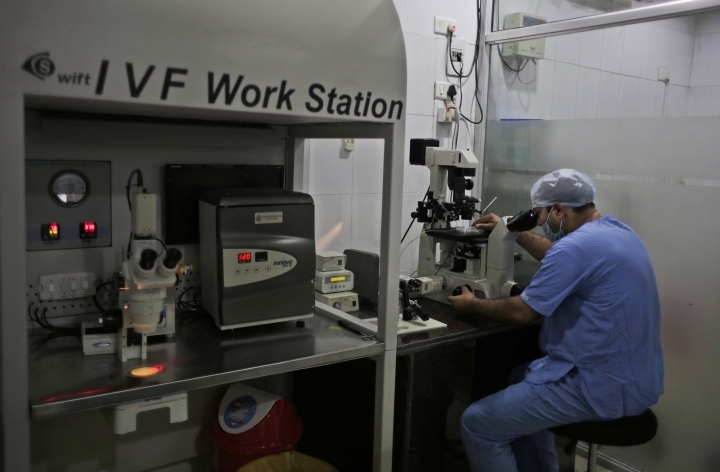 Most medical ethics guidelines around the world recommend a cut-off between 45 and 50 for treatments like IVF, and the Indian Medical Council sets 45 as the recommended age limit. Across the United States and most parts of western Europe, insurance companies usually stop paying for IVF treatment after 45. In the United Kingdom, the limit for fertility treatments under the National Health Service is 42. Every now and then, news reports pop up about women across the world giving birth in their 50s and 60s. A Spanish woman gave birth to healthy twins at age 64 earlier this year after fertility treatments at an undisclosed clinic in the United States. A British woman gave birth in 2008 at the age of 57 after treatment at a clinic in Russia. Many private clinics cap treatment at 50 or less, and most doctors offering assisted reproductive treatments to women over 50 do it on the down low. But Bishnoi, a boyish-looking 41-year-old, doesn't hesitate to send a press release to promote his work, and lists at least 30 patients on his website who gave birth between the ages of 50 and 70. Bishnoi says he is a careful doctor who chooses his patients after a series of medical examinations to ascertain their ability to carry a pregnancy to term. He says age doesn't matter to him; all he examines is whether a patient is physically, emotionally and financially able. He says he has turned away innumerable patients because he wasn't satisfied they were healthy enough, and has never had a patient die. He complains that the doctors who criticize him don't ask about his clinic's success rate, which is 30 percent for mothers above 50. It's an average that is low when compared to IVF success rates for women under the age of 45. But for older women, it's an average that Bishnoi considers "decent." 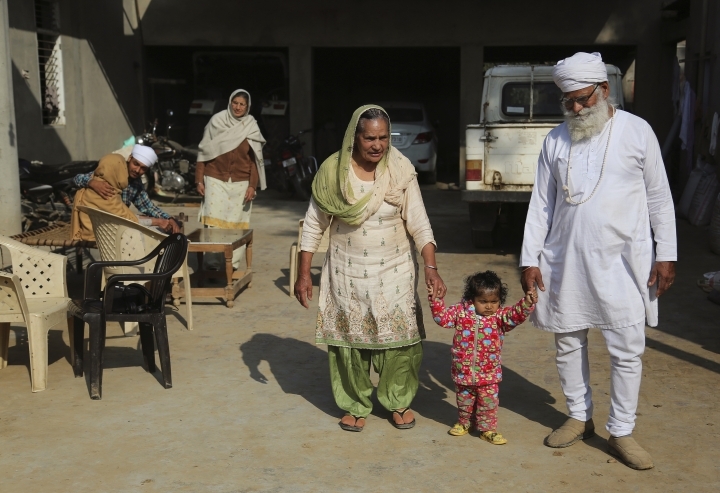 For older patients like Kaur, who make up 20 percent of his practice, Bishnoi harvests eggs from anonymous donors, but in a deeply patriarchal culture, what really matters is that the sperm belongs to the father. He calls reproduction a "fundamental right," and likens his patients to the military. Bishnoi says he suggests adoption or surrogacy to most of his patients, including Kaur, but few are interested. Indian families adopted only 2,210 children in 2016, partly because of daunting levels of bureaucratic hurdles. And the importance of caste and religion are major deterrents. When Bishnoi first suggested Kaur adopt a child, she didn't say anything. "I just started crying," she says. Then he asked her to think about using a surrogate. She remembers breaking down and weeping in his office. "I said, Doctor sahib, I have everything. I even have children around me. Grandchildren too. I play with them, I carry them. Nobody has ever called me 'mummy.' Ever." "If you can give me a child from my own body, then give me that child." "This treatment costs as much as buying a buffalo," says Bishnoi, whose patients are largely from farming families. Gurdev Singh says the money was nothing, as he playfully lets his daughter clamber all over him and coo into his cellphone. "What matters is that he gave us our little doll," Singh says. 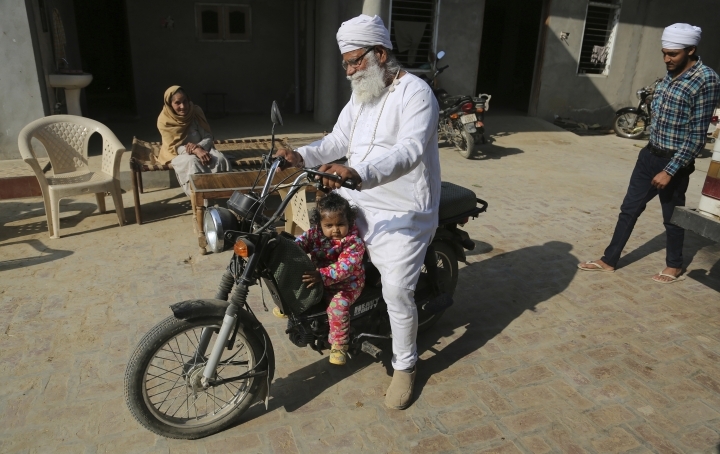 "This is all God's will," Singh says, as little Gurjeet shrieks "papa, papa," with wild abandon.